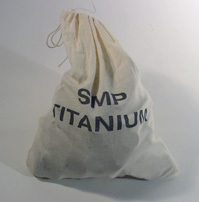 All SMP-Titanium Tablets are packaged in 10 pound cotton bags for ease of handleing. Normally the entire bag is thrown into the metal bath. In most cases the bags are packaged in 500 pound steel drums, 4 drums per skid. We also package the bags in 50 pound cardboard boxes, 40 boxes per skid. Physical description very small tablets measuring 1 inch by 3/4 inch and weighing one ounce. Each Tablet consists of pure titanium sponge. Physical Description very small tablets measuring 1 inch by 3/4 inch and weighing one ounce. Each Tablet consists of a Titanium/Aluminum/Boron blend. Physical Description: 1" x 3/4" (1 oz.) tablet containing pure primary titanium. Typical Packaging: Ten Pounds of tablets per one cotton bag. 500 lbs. per 55-gallon drum, sealed in a plastic liner. Four drums per skid with steel banding (2000 lbs.). Ten pounds of tablets per one cotton bag, 50 lbs. per box, 40 boxes/skid (2000 lbs. ), shrink wrapped. General Information: SMP-100 Tablets are produced exclusively from Pure Primary Titanium sponge/fines. This product is compacted to a density of 2.7 to 3.3 g/cc, (105%-115% density of liquid aluminum). SMP-100 Tablets also offers innovative packaging. The 10-lb. cotton bag allows easy handling for workers. © 2010-2011, Specialty Metallurgical Products. All rights reserved.